Home › Technical › Intercoolers, are they all the same? Intercoolers, are they all the same? So many people ask what is the difference between a good brand intercooler built for the car vs a DIY kit using a universal cooler. From our own research and back to back testing we’ve certainly seen the performance difference between these different options and the performance levels, especially in hot weather is certainly noticeable. The purpose of the intercooler is to lower the intake air temperature to the engine. With turbocharged engines the heat caused by compressing air means the intake air charge is heated to high temperatures, sometimes way over 150 degrees celsius, the more boost you run or the hotter the outside air temperature the greater this heat will be and it needs to be dispersed. Standard intercoolers on vehicles are generally designed on a budget to work with the boost levels expected on the stock vehicle andthe pipe work for these intercoolers is often quite restrictive. Good gains can be had by better flowing pipe work and more efficiently sized and positioned coolers to lower the air temperature. Cooler air charge more density, more density more oxygen and therefore more power and more efficient engine combustion. Our test vehicle is an Astra VXR with a map and full 3″ exhaust system on which we compared different intercooler setups in average British summer conditions of 25 degrees celsius. 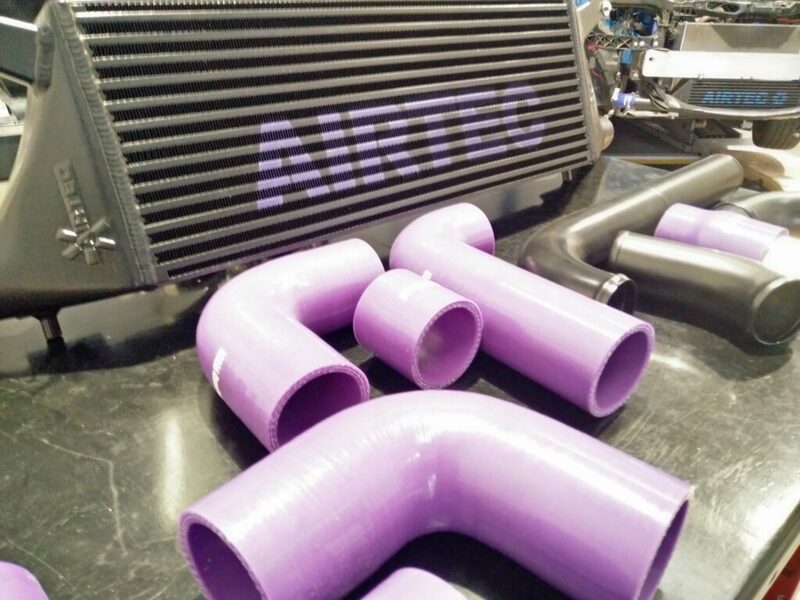 We compared the standard intercooler when the vehicle was stage 2, with our preferred Airtec intercooler compared with a cheaper low cost kit based upon a universal intercooler. Our test conditions was a 30-130 sprint and the difference in results may surprise. The standard intercooler ran up to 63C, which was 38C above ambient. The universal intercooler kit ran up to 57C which is 32C above ambient. The Airtec intercooler kit ran up to 38C which is amazingly only 13 degrees above ambient. After repeated back to back test runs the car also recovered and maintained this maximum temperature far far better than cheaper and standard kit. From this high intake temperature we also observed that the car was experiencing reasonable knock though within the knock control limit on both the standard and universal kits. This means the car has its ignition timing already too advanced and timing is being retarded by the ECU to prevent damage. Though when the ECU reacts it does take a large chunk of timing out which can leave a car feeling flat and less responsive and overall making less power. But after fitting the Airtec we observed absolutely zero knock retard on all cylinders throughout the run. This shows that even more gains were available to the car and we were able to advance timing at WOT by 3-6 degrees across the rev range giving an even greater gain in power. So to summarise, don’t skimp on your intercooler, it is an integral part of your setup giving strong gains and consistency in many weather conditions. Here is a winter test between the airtec cooler, and another branded kit based upon a universal cooler. You’d think in the middle of November at just 6.5 degrees ambient that there would not be much difference, but on this day we were mapping two cars with the same level of tune with the two different intercoolers. As you can see even on a single pull on the same stretch of road in the same ambient conditions on the same day there is a BIG difference. It just goes to show how much a decent intercooler is really worth. The red line shows the intake temperatures of the universal based kit, and the blue line the airtec kit on two Astra VXR Stage 3 cars. 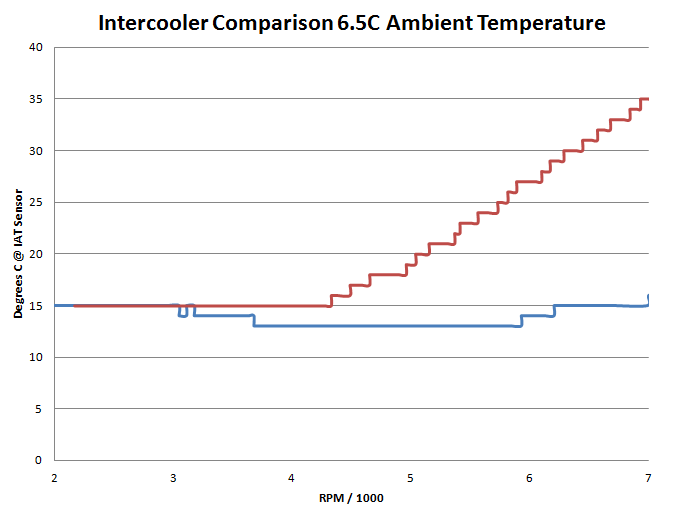 This also shows that the intercoolers are a worth while modification all year round and not just in the summer months.